Been running tubeless for mountain and gravel for years now. Time to give it a shot on the road bike. Haven't pulled the old tires off yet, not sure if the stock wheels come with tubeless ready rim strips or if I need to get some gorilla tape. I don't know if these are 30 or 32c tires, or 31's and Specialized just wants to feel special, but it should be really nice to have the ability to run them down to 40psi if we do a dirt day. At that width, with the air volume involved, I don't see a problem. At a higher pressure and lower volume tire, I question the application unless you're dealing with a lot of thorns and other small punctures that sealant can quickly fix. 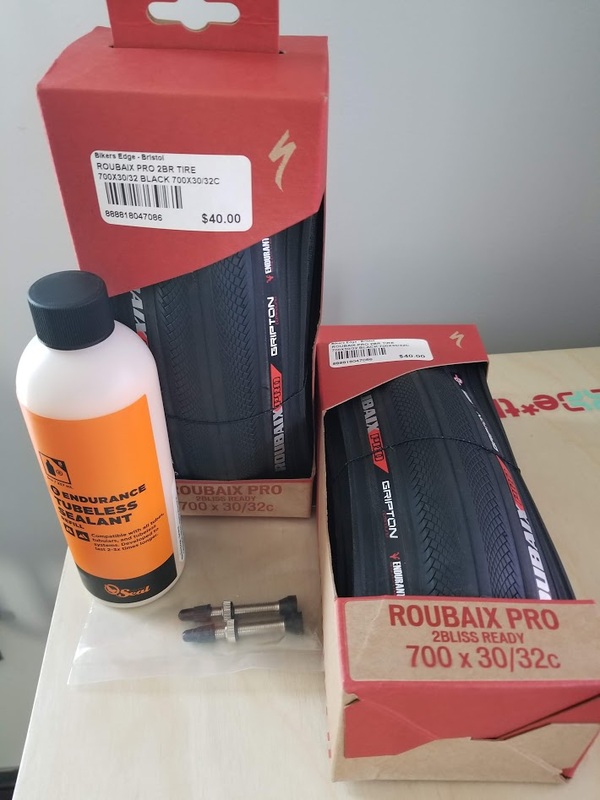 Most of my tires are in the 25c range (rim brake), and most of my flats are large enough I would lose too much air before the sealant plugged the hole for them to be ride-able. Then I would have to fight the tire off the rim, deal with the goop, and install a tube. At this point, the downsides for me outweigh the positives. I have run sealant in tubulars with mixed success. These are pretty large tires, the bike has 28's on it now. Hopefully the larger tires don't make it handle funky. Ahhhhh...I'm guessing based on 'feelz'? They're a 32, and they're great tires, especially for the price. The naming convention comes from back when we thought wider tires offered more rolling resistance, so it was smaller number tread, larger number casing. Comfort of a bigger tire, speed of a smaller tire type thing. No idea why they still stick with the naming convention. It's dumb. I am not concerned about trail changes, but I am guessing that's an inside joke on the forum. As far as handling differences, I have never used a tire this large. The majority of my road riding was in the early 2000's. On 23c tires at about 1 million psi. 6500 mi on my predominantly winter/rain bike. Schwalbe Pro One's 25mm wide using Orange Seal. No flats yet. When replacing tires I've seen sealed pin holes but they sealed without me ever knowing it. Yep, lots of inside jokes here. You're on the inside now, welcome to the forum! Wider tires will not change your handling unless they are too large for your frame, then the frame rub will gave you a super workout. Seriously, use the widest tires you can fit and don't look back. 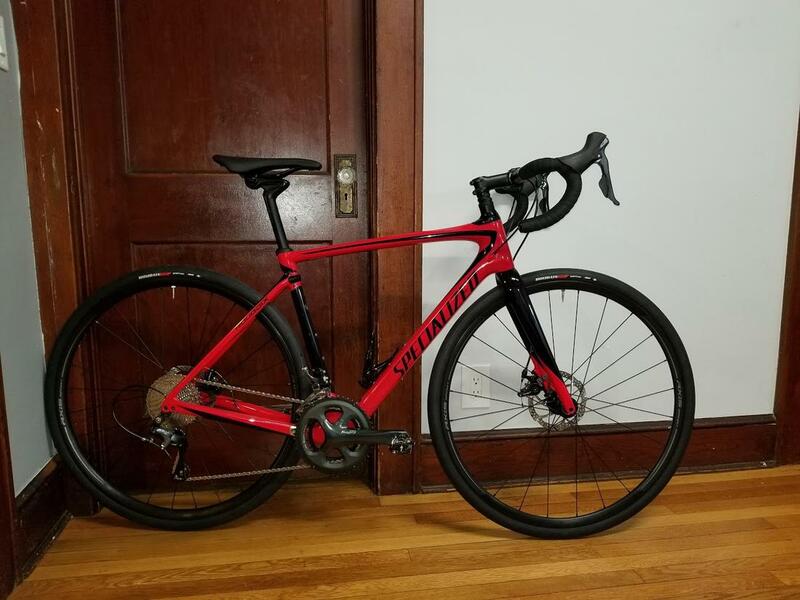 I went to 28mm tires on both my road bikes and will never go back. Who is running 32's on their 'road' bike? Seriously, on the road? I would if I could fit them. The newest Cannondale Synapse Disc models have room for 32mm tires. Try it, you may like it. Unlike the UCI peloton that only races on the smoothest fresh paved roads imaginable...I ride on real life "roads"...which less resemble a mirror-finish smooth ribbon of fresh cured asphalt, and more resemble the the cratered moon. And the roads aren't getting better....this winter did even more damage to them and the City is too broke to repair them. They're wanting to add a $0.25 sales tax to fund road repair. They need fixed and the city/state is broke--there really isn't a choice. They're a hazard to navigation even in a car at this point--not residentials but arterials as well. And then there's all the flooding damage here in Nebraska that basically destroyed all the county highways that were paved. 42's here, seriously, on the road. Trek supplies 32s OEM on the Domane disc. Yep, and they look small to me at this point. I've really gotten used to seeing big tires on road bikes. I have 32mm Hutchinson Sectors on my Aeroad disc. I'm a heavy dude at 200lbs, but they ride like a dream with 80psi. Raced on em too, so they are plenty fast still. Put probably 1000 miles on them so far, no issues and no flats. Anyone want some lightly used Giant 25’s? Well, yeah. And something about what the pros ride. Almost the entire peloton were on 25c tires during Strade Bianchi race, which had 65km of white gravel. Besides the gravel, there were also plenty of bad backcountry roads. A few riders were running 28c's, but those that mattered, were all on 25c. And tire size does affect trail, thus affecting handling. This is physics, yall need to... look.it.up..
Ready for tomorrow's warm(er) weather. I was half tempted to swap some lighter wheels..... but, these roll fine for now. Both my motos are running bigger front wheels, I don't think it is to make the tire last longer. My take is that it aides in turn in, don't think I need more turn-in on the pedal bike, it's quick enough the way it is!